- ECW Ultraclash (September 18, '93) = Public Enemy (Grunge & Rock) beat Jason Knight & Ian Rotten. - ECW Terror At Tabor (November 12, '93) = Public Enemy took down Ian & Axl Rotten. Later on, Grunge was beaten by Tommy Dreamer. 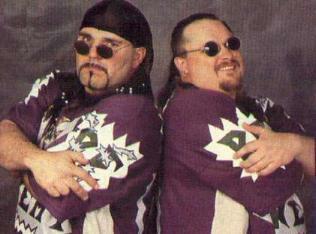 - ECW Arena (January 8, '94) = Public Enemy beat Don E. Allen & Duane Gill. Later on, Public Enemy defeated Keith Shearer & Chad Austin. - ECW Ultimate Jeopardy '94 (March 26) = Public Enemy, Shane Douglas, & Mr. Hughes won a "Wargames" Match over Kevin Sullivan, Terry Funk, Road Warrior Hawk, & the Tazmaniac. - ECW Arena (May 13, '94) = Public Enemy, Shane Douglas, & Mr. Hughes beat Tommy Dreamer, J.T. Smith, & the Bruise Brothers. - ECW When Worlds Collide (May 14, '94) = Public Enemy, Shane Douglas, & Mr. Hughes lost a "Handicap Elimination" Match to J.T. Smith & the Bruise Brothers. - ECW Arena (January 7, '95) = Public Enemy, Chris Benoit, & Dean Malenko lost a "Handicap" Match to 911, Sabu, & Taz. - ECW December To Dismember (December 9, '95) = Public Enemy won over the Heavenly Bodies. Later that night, Public Enemy, Tommy Dreamer, & the Pitbulls won an "Ultimate Jeopardy Steel Cage" Match over The Heavenly Bodies, the Eliminators, and Stevie Richards & Raven. - WCW World War III '96 (November 24) = Public Enemy competed in the WWIII Three-Ring Battle Royal, which was won by the Giant. 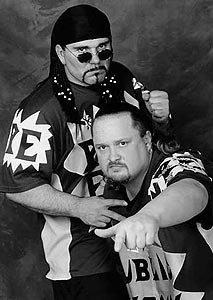 - ECW House Party '99 (January 16) = Public Enemy fought to a No-Contest with the Dudley Boyz. - WCW Bash At The Beach '99 (July 18) = Public Enemy competed in a "Junkyard Battle Royal", which was won by Fit Finlay. - IWF Crawfordsville Show (December 1, '01) = Public Enemy won a "TLC" Match over the High Rollers.